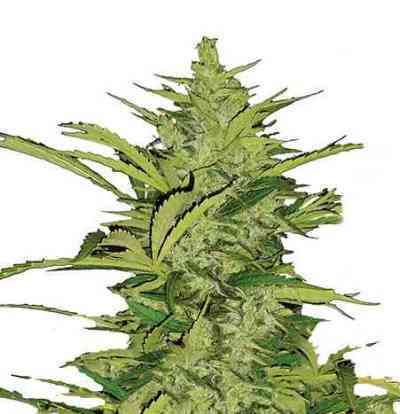 Critical+ Autoflowering CBD cannabis seeds by Dinafem Seeds belong to a feminized CBD-rich cannabis strain derived from the cross between a Critical+ and an Auto CBD. The most popular autoflowering of Dinafem’s catalogue, Critical+ Auto, is now accessible to all thanks to Critical+ Autoflowering CBD, a new strain whose high CBD content has successfully suppressed the strong effect of the original Critical+. Consumers who find it difficult to cope with high levels of THC can, at last, enjoy the classic skunky smell of Critical+ without being hit by an extremely strong/long-lasting “high”. Thanks to Critical+ Autoflowering CBD, all fans of the original skunky smell will be able to enjoy it freely while benefiting from the advantages of CBD: controlled psychoactive effects and a pleasant sensation of physical and psychological well-being caused by the anti-stress properties of this cannabinoid. Critical+ Autoflowering CBD is an Indica-dominant hybrid with a rather Sativa-like appearance: large internodal spacing, long branches and thin leaflets. 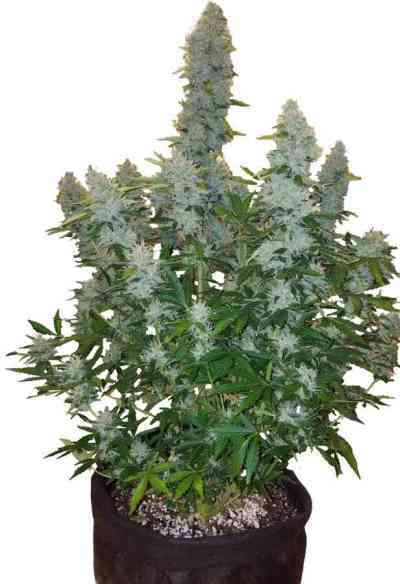 The size and shape of her buds are more Indica, though, that is, more compact and numerous. Critical+ Autoflowering CBD lives up to her dynasty, always delivering numerous dense and resinous buds if grown under adequate growing conditions. Her buds tend to be really thick and compact, far more than what autoflowering strains generally produce. She is easy to grow and flowers fast. Being such an easy cannabis strain means no prior experience is needed to obtain quality crops. In any case, Critical+ Autoflowering CBD, like all her sisters, grows marvellously in SOG (Sea of Green), a growing technique to optimise the available space indoors. Cultivating a maximum of 9-16 plants per square metre is recommended if we want each of them to show their full potential. If we all have to single out one particular trait of Critical+, that would be, without any shadow of a doubt, her flavour and aroma. That’s why, when creating this new version, it was Dinafem’s priority to keep them untouched. And, with Critical+ Autoflowering CBD, Dinafem’s team has, once again, managed to do it right, but with a little difference. While in the breeding, they observed the orangey scent of their CBD elite line matched perfectly with the citrus skunky aroma of Critical+. They have succeeded in conferring some new nuances to the intense skunk fragrance of Critical+ by making the sweet orange scent more evident. As with all CBD-rich strains, the high levels of cannabidiol make sure the psychoactive effects are less intense and more controlled, although this would depend on the user’s tolerance to cannabis as well as on the amount of marijuana consumed. What is clear, though, is that the effect is always going to be gentler than the one delivered by a non-CBD strain. CBD reduces the psychoactive effects of THC but, since the latter doesn’t completely disappear, Critical+ Autoflowering CBD is perfect for those who want a relaxing “high” without suffering from tachycardia or a hangover. Dinafem Seeds believes CBD to be the healthiest and most sustainable option for those people who'd rather go through a gentle experience.